(Not) Blue Soup. Bridget Jones's diary. Will be marvellous. Will become known as brilliant but apparently effortless cook. 8.35 p.m. Oh my God. Just took the lid off casserole to remove carcasses. Soup is bright blue. I lived at home throughout university. By the time plans to move out of my childhood bedroom (to England, no less) came to fruition, longing for my own flat had reached fever pitch. Two friends and I put a deposit on a place five days after I arrived. That first London flat sat across the road from a 24hr McDonalds (a joy at 4am), above a Lloyds Bank and an Indian restaurant, and right on one of the busiest streets in London. It had electric blue carpet, a glow in the dark kitchen window and, inexplicably, wallpaper in the bathroom that was forever peeling from around the shower. It housed my first dinner parties, my first real Christmas tree, my first flatmates, and saw me through my first jobs and internships. those early boughs of homesickness, and the beginnings of my book collection. I loved it, but it's not what I had spent my teenage years imagining. Raised on Richard Curtis films and episodes of The Naked Chef, my picture of my first London home was of a nice flat, somewhere in Zone 1 or 2, that I'd be living in on my own. Bridget's flat, paid for on a publishing assistant's salary, set me up for real estate disappointment. Happily, the nature of her friendships turned out to be perfectly judged. Bridget's team of 'singletons' provided me a rare picture (albeit a dysfunctional one) of the family you could create as an adult - outside of the one you came from. Twenty years on from her experience of London, with more 20- and 30-somethings single than ever before, Bridget's friendships feel more relevant than ever. Like most of my friends, I am here in this city without my immediate family. We have Skype, and WhatsApp, and cheaper travel options than my parents' generation, but my family aren't here for the day-to-day. And so, inevitably, my friends have become my second family. We've held each other's hands through stressful medical appointments, shared bottles of red wine in the face of redundancies, handled devastating break-ups with aplomb, taken trips abroad, cooked each other Christmas dinners, and we've celebrated new jobs and new loves and new homes and risks that have paid off. These friendships are so much more than I dared imagine when I was at school. They are some of the most important and meaningful relationships I imagine I'll have in my life. I've been asked many times about recreating the meal Bridget serves to a collection of her friends one Tuesday in November. What she ends up putting on the table is blue soup, omelette, and a marmalade (of sorts) - her plans for Michelin-worthy cuisine scuppered by the fact that she has a job, very little natural cooking instinct and an overly complex Marco Pierre White menu in front of her. As a general rule, I'd avoid attempting anything that sounds like a Masterchef offering (Char-grilled Tuna on Velouté of Cherry Tomatoes Coulis with Confit of Garlic and Fondant Potatoes), for the first time on a Tuesday night for eight guests. I was going to suggest that, for a mid-week dinner party, you avoid this soup too, but then I made it. In all honesty, the trickiest part of it is poaching the eggs - everything else is pretty much just standard soup making: chop, boil, blitz. If you like, you can make it over a couple of consecutive evenings (I've broken down the recipe below in case that helps), without much hands on work each night. You can make the stock weeks in advance and store it in the freezer. 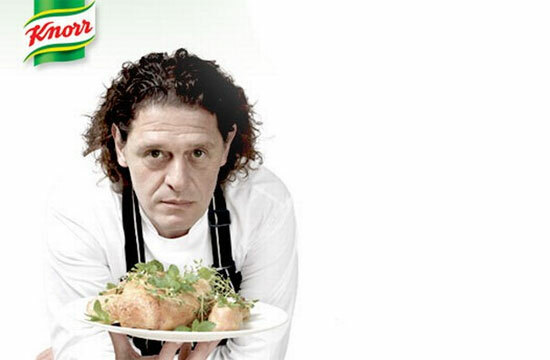 You can also, of course, use shop bought stock; for goodness sakes, Marco Pierre White has spent the past decade as the face of Knorr. At the end of the day, whatever you cook, good friends won't care how it turns out. As Mark Darcy tells Bridget: "Remember everyone's coming to see you, not to eat parfaits in sugar cages". Quite right too. 1. If you're using a chicken carcass, you don't need to pre-cook the bones. If you're using leg bones or wings, brown them in the pan for a couple of minutes over a medium heat. 2. Chop the stock vegetables roughly and add them to the large saucepan. Add 1.5l of water, bring the stock to the boil and then reduce to a very gentle simmer. Cook for 2 hours with the lid on, and then a final hour with the lid off. Allow the stock to cool. 3. Strain the stock, storing the liquid in the fridge or freezer until you need it. 4. Chop the celery, celeriac, leek and onion into small dice. Melt the butter in the large saucepan and add the vegetables, cooking them over a medium heat until translucent (don't let them brown here, you just want them soft). 5. Peel the potato and chop into pieces. Add to the medium saucepan with the stock and cream, and bring to the boil. Pour over the diced vegetables in the other saucepan and cook for ten minutes or so. 6. Allow the soup to cool a little, and then blitz until smooth. Taste the soup, and season - it's a delicately flavoured soup, so add salt and pepper with a light hand. Push through a fine sieve, and pour back into a saucepan, ready to warm through once you're ready to serve. 7. To serve, start warming the soup through over a low heat. Poach the eggs (I crack each egg into a glass and then swirl simmering water in a pan, before dropping them in), and then spoon one into the base of each bowl. Ladle the soup over the eggs and snip some chives over the top. Spaghetti al Pomodoro. Looking for Alibrandi. Oh God, if anyone found out about it I'd die. There we sat, last Saturday, in my grandmother's backyard, cutting the bad bits off over-ripe tomatoes and squeezing them. After doing ten crates of those, we boiled them, squashed them, then boiled them again. That in turn made spaghetti sauce. We bottled it in beer bottles and stored it in Nonna's cellar. Like all tomato days we had spaghetti that night. Made by our own hands. A tradition that we'll never let go. A tradition that I will probably never let go of either, simply because like religion, culture is nailed into you so deep you can't escape it. No matter how far you run. I thought I was Italian until I was twelve. I don't quite know how to explain this to you, except to say that, as a young impressionable girl, I saw some films, then looked around at my dark-haired, dark-eyed, tan-skinned, wine-and-food-loving family and made a cognitive leap. It wasn't until I had to complete a family tree for school that I discovered, amongst the convicts and Irish immigrants, a distinct lack of Italian surnames. Not too long after this disappointing realisation, my family won a trip to Europe. In addition to time spent in London, the Cotswolds and Paris, we spent a week in a villa in Tuscany, with views across the vineyards, proximity to countless gelatarias and a kitchen with an enormous long wooden table. I felt strangely at home, in this new country where I didn't speak the language. I was hooked. My love of all things Italian came to a head during secondary school, when I first read Looking for Alibrandi. I wanted desperately to be Josephine Alibrandi, and was so thrilled by the little things we had in common: Catholic girls' schools, a love of debating, a local gossip ring that never allowed us to get away with anything. The book itself is wonderful - I assume that most Australians my age have read it (or have at least seen the film), but if you've never heard of it, do seek it out. I'd quite like to hand copies of it out to all the teenagers I've worked with over the years; it brilliantly explores that unique pain/joy of stepping into adulthood and discovering who it is that you want to be. The excerpt above is the opening and closing of a chapter set during Tomato Day. It's an incredibly memorable scene, and there's nothing else I could I imagine cooking in remembrance of this book. I just wish my mum and granny had been here to help me make it. 1. Pull the tomatoes off their vines, cut out the core and make a cross with your knife in the top of each. Blanch in boiling water for one minute, then remove and place straight into iced water. The skins will now slip off easily. 2. Squash the tomatoes with your hands (take time over this bit - enjoy it) and place over a low-medium heat to bubble away for about an hour. Push the sauce through a sieve to remove the seeds and boil again for another 20 mins. You should have a thick, rich sauce. Pour into hot, sterilised bottles for storage. 3. To make the spaghetti, pour the flour into a mound on your bench. Make a well in the middle, crack the eggs in, and incorporate the flour into the eggs, swirling it around with a fork to mix it in. Once incorporated, knead the pasta dough for ten minutes or so, until very smooth and silky. Wrap in cling film and store in the fridge for at least half an hour. 4. If you have a pasta machine, this next step will be relatively easy. Cut your dough into four even pieces and, working with one at a time, dust in flour, roll out with a rolling pin and then run through the pasta machine settings until very thin (start with the widest and run through this a couple of times to get started). If you have a spaghetti attachment, slice it using that and hang to dry while you shape the rest. If you don't have a pasta machine, you'll need to roll it out by hand. Work with small pieces and keep rolling until the pasta is just slightly thicker than a playing card. Dust with lots of flour, roll up to make cutting easier, and slice into strips by hand. 5. Put on a big pot of generously salted water to boil. Put the tomato sauce in a pan (you'll need to use one big enough to hold your cooked pasta) over a medium heat. Once the water is boiling, drop the pasta in and cook until al dente (still with a bit of bite). With fresh pasta this will take minutes only, so keep an eye on it. 6. Drain the pasta and tip into the warmed pasta sauce. Add some salt and pepper. Stir through and serve with fresh basil and a dribble of very good olive oil. I am not much of a party girl - to be honest, I'd pretty much always rather spend a Friday night in my bath with a book. That said, I am a huge fan of a very late night/wee morning hours supper. When friends and I arrive home after an evening of gin and dancing, I've been known to make sushi, a bastardised croque-monsieur, a batch of peanut butter and chocolate biscuits, a super-quick tuna pasta or, every now and then, a frittata. I love this part of a night out - a jolly, if slightly hazy, camaraderie that is cemented as we sit around a table, or on the bench top, or on the living room floor, picking over the events of the evening. So when my friend Sonia reminded me of the passage above, I immediately thought of mushrooms on toast - one of my very favourite midnight suppers. Buttery sautéed mushrooms, thyme, lots of pepper and some crunchy toast; ingredients that are not only delicious, but (crucially) are pretty much always in my flat. However, for the kind of mushrooms that Prospero's elves might make, I'd have to look beyond the standard chestnut, portobello and button. Perhaps do as I did and save these glorious beauties for a special meal. You can always replace the mushrooms above with some more easily available ones when preparing a slightly less sober midnight feast. 1. Chop your mushrooms into manageable sizes. The clamshells need to be separated from each other, oysters cut into a couple of pieces and eryngii sliced into thin lengths. 2. Warm the pan over a moderate heat and add a drizzle of rapeseed oil. As much as patience/inebriation will allow, cook the mushrooms in small batches, taking care not to crowd them. You want them to brown in places, and release some of their water, which will evaporate if you've given them space. Turn them and then remove to a bowl once they're cooked. Repeat until all mushrooms have been browned on all sides. 3. Tip all the mushrooms back into the pan and add the butter. Strip the thyme leaves from the sprigs and add them too. Toss the mushrooms around until they are hot and the butter has melted. Season generously with pepper. 4. Toast the sourdough until lightly golden (don't overdo it or you'll lose its wonderful chewiness) and spread with lots of ricotta. Top with the mushrooms, sprigs of lemon thyme, a sprinkle of sea salt, a squeeze of lemon juice and a trickle of truffle oil. Eat immediately. ps. A little final note. I know I've mentioned this before, but I wanted to share with you a little teaser for my upcoming supper club. Can't wait to share the photos, recipes and (if you're in London) food with you!